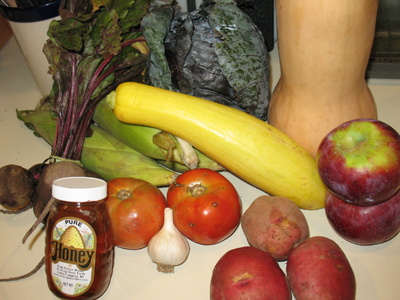 Adventures in CSA (week 4): Oooh…honey!! Well, this week’s CSA had an extra special surprise: honey! Turns out, one of the farms that supplies produce for the CSA I’m getting has honeybees that they use to pollinate their crops, and they bottle some of their own honey! I don’t know that I’ve ever had organic honey before, so I’m really looking forward to doing something with it (even if it’s just making a peanut butter & honey sandwich. Mmm. Again, I’m thinking that this is unlikely to be one of those weeks where the price difference between CSA and store is all that vast, but I’ve been fooled before! The big question is: what to make? The corn’s already eaten (of course), and it was tasty, albeit quite immature (thus, it had very small, shallow kernels). There’s a very good possibility that the potatoes and the tomatoes will end up in a stew of some kind; the temperatures are supposed to dip enough that we may need a stew this week. As for the beets, I have a scheme in mind for them…and it involves the oven this time (so they can keep their color). The crock pot did fine at preserving their flavor, but it leeched all of the color out of them. And, if I can get this to work out right, this may be the final stage in my conversion to “beet lover”. The purple cabbage presents an interesting challenge, although I may just make some mu shu. The funny thing with cabbage is that I really only prefer it when it has some crunch; having it cooked to the point of complete limpness (and combining it with something like corned beef) has never appealed to me. Wild honey has a much stronger flavor than pure clover honey — you’ll probably love it, but be prepared for something that likely tastes very different than what you’re used to. I have a cabbage from this week’s CSA haul as well, and am probably using it to make a grilled beef and cabbage salad with spicy peanut dressing. I didn’t realize that the flavor was that different. Now I’m REALLY psyched for it. The question then becomes: will it spoil me for pure clover honey? Yes 😉 Sorry about that.